Couselo J.L., Vela P., Salinero C., Mansilla P.
Estación Fitopatolóxica de Areeiro, Deputación de Pontevedra. Subida a la Robleda s/n 36153 Spain. Ciborinia camelliae is the causal agent of the disease known as camellia flower blight (CFB) or camellia petal blight and it is regarded as the main phytosanitary problem affecting camellia flowers. Although only the ascospores (a type of spore formed in a structure known as asci) are able to infect camellia flowers, none of the strategies aimed to control this disease has been effective. The genus Camellia contains about 200 species, with some controversy as to their exact number (Jiyin et al. 2005). Some species such as C. japonica and C. reticulata have been bred over centuries because of their ornamental value. Today, thousands of varieties can be found (Savige 1993-2010). Species such as C. lutchuensis (with small fragrant flowers) have been used to obtain hybrids with aromatic and medium-size flowers. However, resistance to Ciborinia has not been a desirable trait so far. C. camelliae is currently spread almost worldwide, so resistant varieties would be desirable. The existence of a certain degree of resistance in some Camellia species/hybrids has been suggested over recent years (Taylor 2004, Denton-Giles 2013). 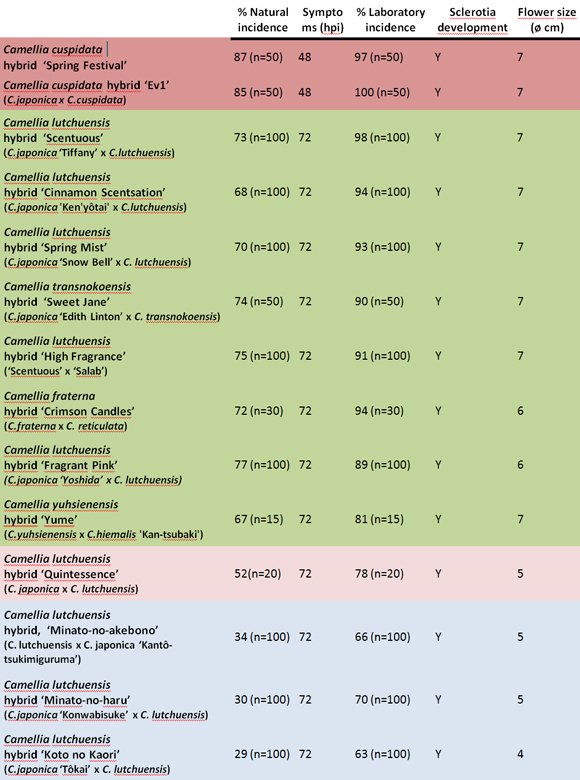 The aim of this work was to determine the susceptibility degree of 31 Camellia species and hybrids. Susceptibility was determined in relation to the incidence of the fungus (naturally and in the laboratory) and the incubation period (time from inoculation until the onset of symptoms; hpi). 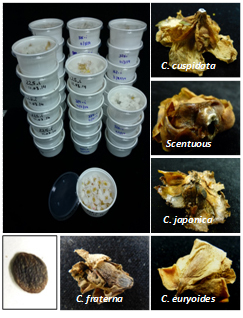 The ability of C. camelliae to complete its life cycle through the formation of sclerotia was also studied. We have studied the susceptibility to CFB using symptomatic field-collected camellia flowers (naturally inoculated) and also asymptomatic flowers that were inoculated with ascospores at the laboratory. Field-collected apothecia were placed in sterile Falcon tubes for 24/48 h to collect the spores and perform inoculations. The concentration of spore suspension was adjusted to 5•105 spores/mL with purified water. The inoculations were performed by surface spraying and the time to onset of symptoms (hours post inoculation; hpi) was registered (20°C and 70% RH). Figure 1. A, field-collected flowers with petal blight symptoms to establish presence/absence of C. camelliae. B, Collecting spores from apothecia. Asymptomatic flowers inoculated by surface spraying (0 hpi). Some naturally and artificially inoculated flowers were used to determine sclerotia formation (Figure 2). Figure 2. Sclerotia development in Camellia sp. flowers inoculated with C. camelliae ascospores. Similarly, other flowers were used to determine the causal agent of damages. For this purpose, we excised the damaged pieces of petals. Pieces were then washed with purified water supplemented with Tween 20 and surface-sterilized with NaClO. Then they were placed on a PDA plate. Plates were incubated at 25°C in darkness. Isolates were subsequently identified by morphological characteristics and by sequencing ITS region and β-tubulin gene (Figure 3, 4). Figure 3. From symptomatic petal to C. camellia isolate. A, cutting damaged pieces of petals. B, surface sterilization. C, sterilized pieces placed on PDA plate. D, incubation at 25°C. E, C. camelliae isolates. Figure 4. A, fungal DNA extraction. B, followed by ITS/ β-tubulin amplification. The amplicon is the template of the sequencing reaction. C, Genetic Analyzer provides bidirectional sequence data. 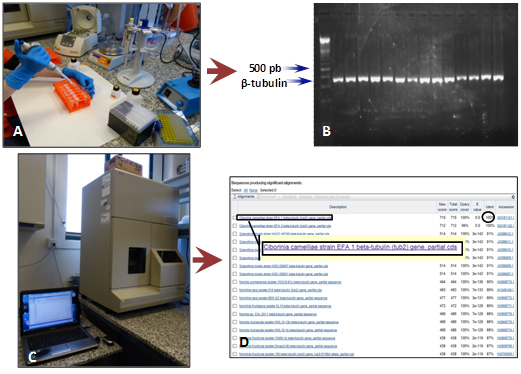 D, ITS/ β-tubulin sequence is finally identified using Nucleotaide BLAST (Basic Local Alignment Search Tool) from NCBI (National Center for Biotechnology Information, http://www.ncbi.nlm.nih.gov/). A total of 31 Camellia species and hybrids were evaluated: Camellia grijsii, C. lutchuensis, C. transnokoensis, C. longicarpa, C. yuhsienensis, C. yunnanensis, C. granthamiana, C. rosiflora, C. changii, C. transarisanensis, C. saluenensis, C. fraterna, C. euryoides, C. sasanqua, C. japonica, C. reticulata and C. cuspidata. Nine C. lutchuensis hybrids (‘Fragrant Pink’, ‘Quintessence’, ‘Scentuous’, ‘Cinnamon scentsation’, ‘High Fragrance’, ‘Spring Mist’, ‘Minato-no-akebono’, ‘Minato-no-haru’ and ‘Koto-no-Kaori’); one C. transnokoensis hybrid (‘Sweet Jane’); one C. yuhsienensis hybrid (‘C. hiemalis’); one C. fraterna hybrid (‘Crimson Candles’) and two C. cuspidata hybrids (‘Spring Festival’ and ‘EV1’) (Figure 5). Figure 5. Flowers of the species (A) and hybrids (B) evaluated. The degree of susceptibility was assigned based on I) natural incidence, ii) the incidence after inoculation in the laboratory with ascospores (the incidence was measured as the percentage of C. camelliae isolates achieved from damaged pieces of petals), iii) hours post inoculation (hpi) to the appearance of symptoms iv) development/absence of sclerotia. Statistical analysis of incidence was performed by Pearson's chi-squared test (χ2; p-value<0.05) using the statistical software SPSS 15.0. 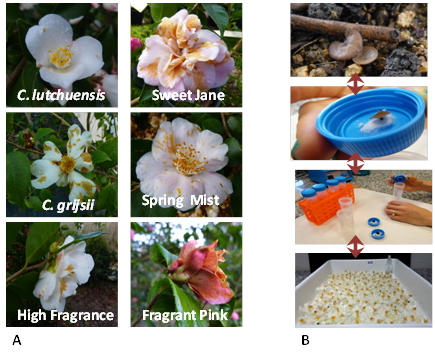 C. camelliae was isolated in all evaluated Camellia species and hybrids, both in naturally-infected flowers (field-collected) and in the flowers inoculated in the laboratory. However, the incubation period and the incidence were different depending on the species/hybrid (Table 1, 2). Six susceptibility clusters of species can be differentiated (Table 1). C. reticulata, C. yunnanensis, C. saluenensis, C. granthamiana, C. sasanqua, C. cuspidata, C. changii, C. transarisanensis are clustered with C. japonica in a very susceptible group. C. grijsii is a special susceptible species, since it does not develop sclerotia. C. euryoides and C. rosaeflora are clustered together. Both species have a moderate susceptibility although symptoms appear later in C. rosaeflora than in C. euryoides (48 hpi vs. 72 hpi). C. fraterna is a low-susceptible species in which sclerotia are formed. C. longicarpa and C. transnokoensis show a low susceptibility to C. camelliae and sclerotia are not formed. The less susceptible species are C. lutchuensis and C. yuhsienensis, although symptoms appear later in C. yuhsienensis than in C. lutchuensis (72 vs 96 hpi hpi). 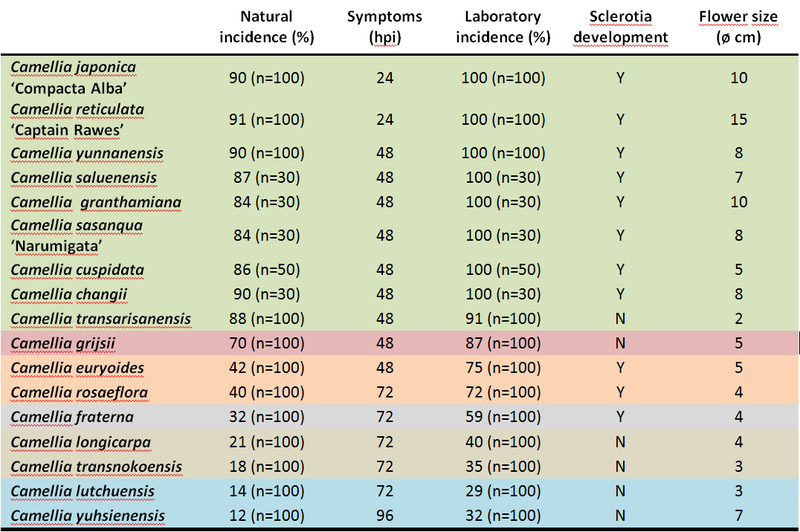 Four susceptibility clusters of hybrids can be differentiated (Table 2). C. cuspidata hybrids are highly susceptible to C. camelliae. C. lutchuensis hybrids show three degrees of susceptibility (Table 2). While ‘Scentuous’, ‘Cinnamon Scentsation’, ‘Spring Mist’, ‘High Fragrance’ and ‘Fragrant Pink’ are quite susceptible hybrids, the hybrid ‘Quintessence’ is only moderately susceptible and hybrids ‘Minato-no-akebono’, ‘Minato-no-haru’ and ‘Koto no Kaori’ have low susceptibility. Hybrids of C. transnokoensis, C. fraterna and C. yuhsienensis are clustered together as quite susceptible to the disease. An inverse relationship between susceptibility and flower size has been observed in hybrids but not in species. The incubation period (hpi) was longer in the hybrids than in the most susceptible progenitor (C. japonica, C. reticulata, C. cuspidata and C. hiemalis). C. camelliae may form sclerotia in most species of the genus except C. transarisanensis, C. grijsii, C. longicarpa, C. transnokoensis, C. lutchuensis and C. yuhsienensis. However, sclerotia were formed in all hybrids from these species (Table 2). The incidence in hybrids was lower or equal to that recorded in the most susceptible progenitor (C. japonica, C. reticulata, C. cuspidata and C. hiemalis). However, the incidence was consistently higher in the hybrids than in the least susceptible progenitor (C. lutchuensis, C. transnokoensis, C. yuhsienenesis, C. fraterna) (Table 1). In all cases, incidence signficantly increased when spores were sprayed on the flowers in the laboratory. In addition, there is a clear correlation between natural and laboratory incidence. Table 1. Susceptibility clusters of Camellia species (the species shaded with the same color did not differ significantly; p-value 0.05). Table 2. Susceptibility clusters of Camellia hybrids (the hybrids shaded with the same color did not differ significantly; p-value 0.05). A plant is considered susceptible when it serves as a host to a pathogen. The pathogen is able to penetrate it and cause the characteristic symptoms of the disease. Different degrees of susceptibility can be defined depending on the difficulty of the pathogen to cause disease. The term resistance is the opposite of susceptibility. It is the property of a plant to resist penetration and therefore infection, and no symptoms appear. Tolerance is an intermediate quality between resistance and susceptibility. It defines plants that exhibit little or no damage despite substantial pathogen levels with mild to non-existent symptoms. These three concepts are directly related to the genetic variability of the pathogen, to the genetic variability of the host plant and to the environmental conditions. Thus, different strains of the same pathogen can cause various degrees of susceptibility in a single plant, different varieties of the plant may have diverse susceptibilities to the same pathogen and variation in environmental conditions can vary the susceptibility of a plant. Only C. camelliae ascospores are capable of triggering CFB. Ascospores are derived from sexual reproduction, thus showing a high genetic variability. However, to date, no methodology is available to determine potential differences in spore pathogenicity. Therefore, only the resistence/susceptibility/tolerance on the basis of the genetic variabilty of camellia plants (different species and hybrids) subjected to similar environmental conditions can be assesed. C. camelliae could be isolated in all species, both in naturally infected flowers and in flowers inoculated in the laboratory, so we could not find resistance (sensu stricto) in any of the studied species of the genus Camellia. However, we could establish degrees of susceptibility. The same happens with all the hybrids studied. Hybridization of susceptible camellias (C. japonica, C. reticulata, …) with less susceptible species (C. lutchuensis, C. transnokoensis, C. fraterna, C. yuhsienensis) allows us to produce varieties showing an intermediate susceptibility. The susceptibility degree of hybrids seems to decrease with the size of the flower. Without parental resistance (sensu stricto), it seems difficult to obtain CFB-resistant hybrids of ornamental value. As regards the incubation period, in the species it is closely related to the incidence of the pathogen. However, it is not the same for hybrids. The hybrid ‘Scentuous’ starts to show symptoms 72 hpi and presented a 98% incidence in the laboratory, whereas in the hybrid ‘Koto no Kaori’ symptoms were apparent 72 hpi but the incidence in the laboratory was significantly lower (63%). This suggests that this factor should not be considered in isolation to establish the degree of susceptibility of the camellias, especially for hybrids. The development or absence of sclerotia in the flowers is an indicador of the ability of the fungus to complete its life cycle. Sclerotia were not formed in any of the four species less susceptible (C. longicarpa, C. transnokoensis, C. lutchuensis and C. yuhsienensis) nor in two susceptible species C. transarisanensis and C. grijsii. These results show that is not posible to determine the importance of sclerotia formation in the degree of susceptibility of a Camellia species. The fact that sclerotia are not formed in some species of the genus Camellia may be related both to the size of the flower and to the degree of susceptibility. The existence of different levels of susceptibility will be useful to determine the molecular mechanisms and the genetic basis of the disease (CFB). This information may be used for molecular breeding of genus Camellia. Authors would like to thank the Spanish Camellia Society and the Pontevedra Provincial Government for their material and economic contribution to this work. The team of the Plant Biotechnology Unit at the Plant Pathology Service “Estación fitopatoloxica do Areeiro” has performed this work. Authors wish to thank Alicia del Carmen and Cristina García Marín for their valuable technical support. Jiyin G., Parks C., Yuequiang D. (2005). Collected species of the genus Camellia an illustrated outline. ISBN: 7-5341-2594-4. Savige T.J. (1993-2010). The International Camellia Register. Ed. International Camellia Society. Taylor C.H. (2004). Studies of Camellia Flower Blight (Kohn). Phd Thesis. Massey University, New Zealand. Denton-Giles M1, Bradshaw RE, Dijkwel PP. (2013). Ciborinia camelliae (Sclerotiniaceae) induces variable plant resistance responses in selected species of Camellia. Phytopathology. 103(7):725-32. doi: 10.1094/PHYTO-11-12-0289-R.